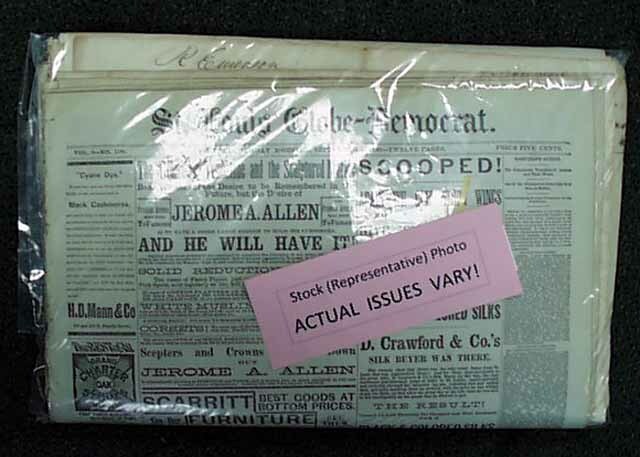 Item # 559183 WHOLESALE VARIETY LOT A lot of 50 2nd-rate and damaged American newspapers dating from 1820 - 1896, containing at least 7 different titles within the lot. The issues may have staining, edge tears, close-trimming, heavy foxing & wear, missing pages, cut-outs, etc. A great lot for a dealer or for someone wishing to begin a collection when condition is not a concern. Please note the shipping & handling for this lot.